Meet the FlexiRoll … the only needle case designed specifically for the metal addi FlexiFlips! The product of a collaboration between skacel and DellaQ, this perfectly proportioned storage system was designed to house a full set of metal addi FlexiFlips (US 0 to US 8). Each case is constructed of high-quality canvas, and is available in either Denim or Natural. A single zippered pocket on the outside allows for the storage of an addi needle gauge, gold plated scissors, or any other small notions you may want easily accessible. 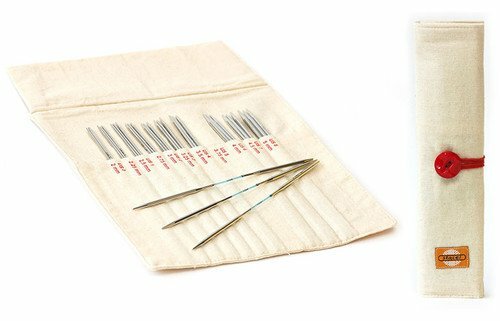 Securing your needles is simple, just roll one end of the pouch towards the other, and fasten with the easy-to-use twine and button closure.